Your Project Dashboard is a snapshot view of your account's current capacity. 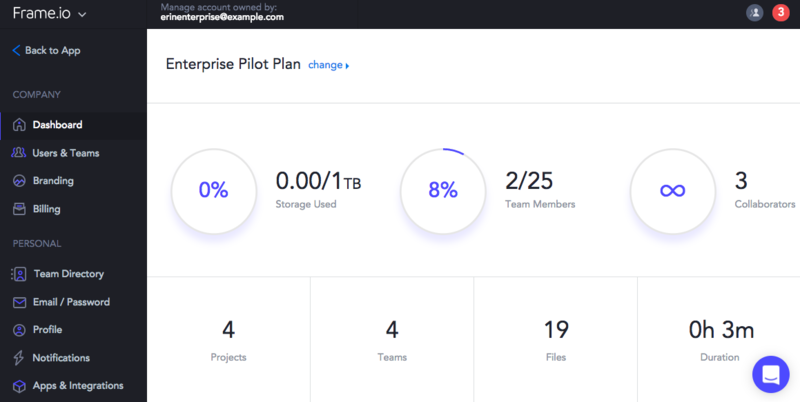 It shows you how much storage your account is currently using, how many team members are currently added to your account, how many collaborators are currently added to your account and how many projects you have. This is helpful so that you can manage your work without exceeding the limits of your account. It can be accessed here or by selecting the Frame.io logo on the top left, clicking Account Settings and choosing the Dashboard tab on the left. Please Note: At the moment, if you're looking at the project size this will not reflect folders or version stacks which means any files inside of folders or versioned on top of each other are not counted into the total at this time- each folder is calculated by itself and if you have multiple versions in a version stack each file is not automatically added to the total storage.